After the last few entries of assembly here’s a review of the exploded workshop manual drawings. I’ve posted these before during research but now we’ve seen the components go back together they have more life. 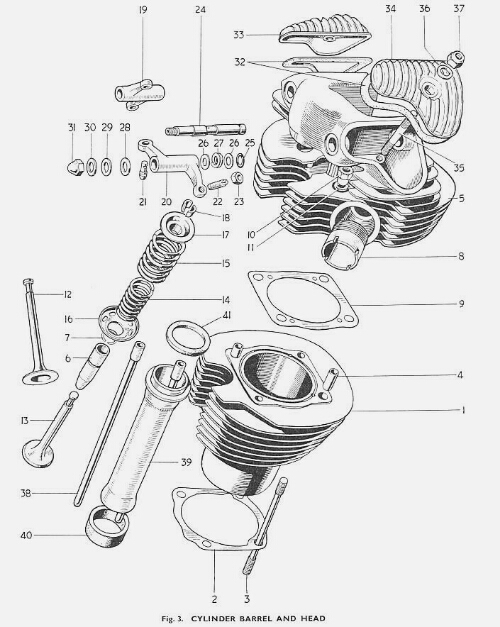 The cylinder head with valves; crankshaft, pistons and timing cams. I like the penmanship of these technical drawings, you can see the draughtsmans unique hand in them. The clutch is the hidden unsung hero of the transmission: where rotational power is transfered from the engine driveshaft, through the gearbox and on to the back wheel. Allowing power to be controlled to change gearing whilst allowing the engine to continue spinning. 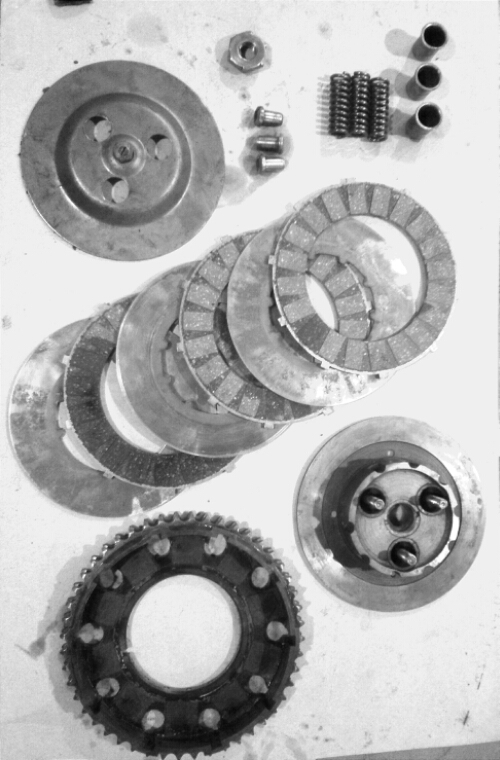 Known as a basket clutch it contains a series of alternating friction and smooth plates each with inner and outer lugs that provide a keyed link between the outer drive drum and inner driven shaft. Under normal operation springs squeeze the plates together forming the engine to wheel power transmission. When the clutch lever is pulled in the clutch is disengaged. 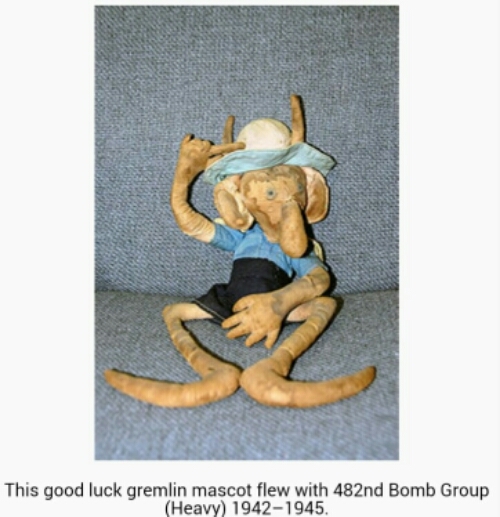 But you all know that! The rear shocks arrived today, ordered directly from NJB Suspension in the UK who manufacture rear units specifically for Triumph Cubs; amongst other pre 65 twin shock machines. 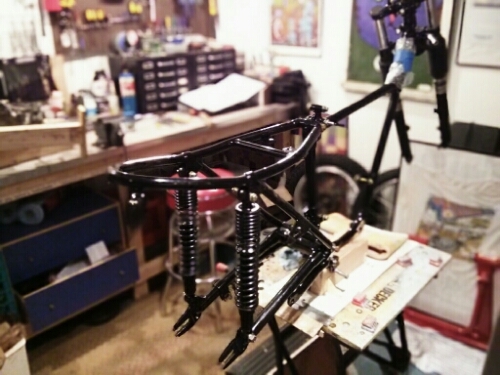 They slotted straight on and, along with the forks threaded into the steering head triple tree, start to give the chassis some semblance of the motorbike it it yet to be. I could attach the wheels and she’d roll! Progress! The pieces fit together as planned; well, mostly. 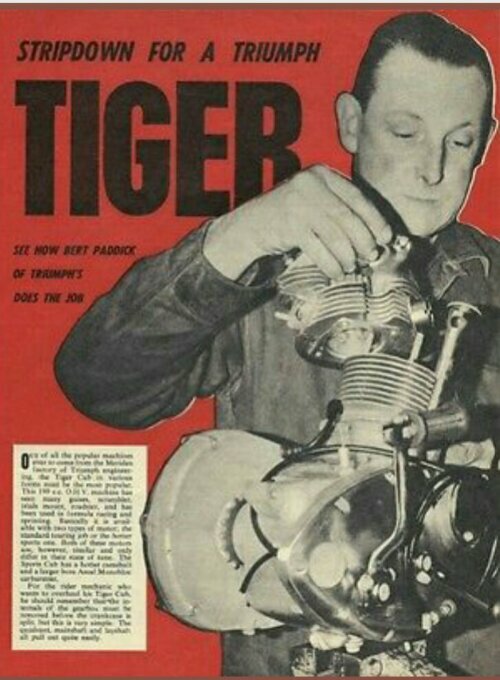 That is what the soft blow hammer is for, to encourage the required mating of the Cub engine components. 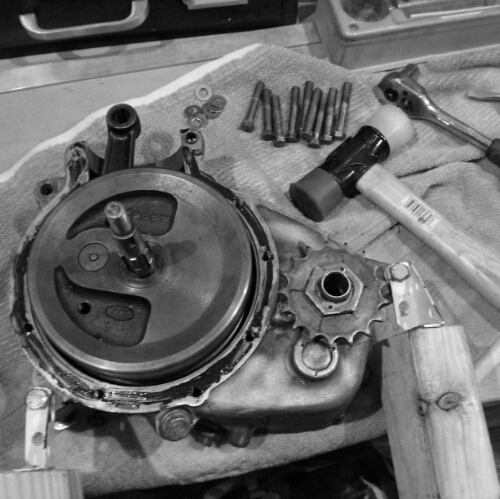 Today the case halves were reunited again with enclosed crankshaft. 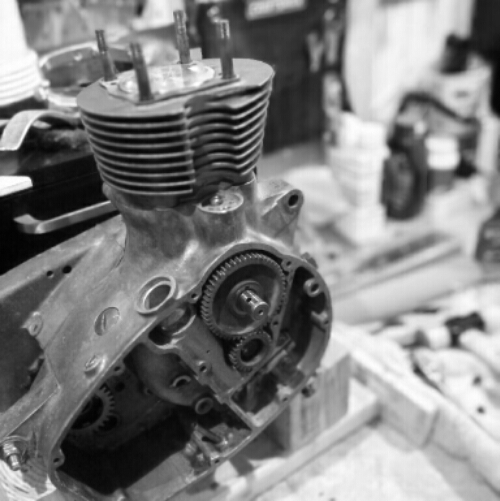 Chilled bearings were driven home, oil seals installed and the main gear spindle with drive sprocket, and the weighty big-end threaded correctly to its bushing, then the cases buttoned up with a smear of liquid gasket and nine peripheral bolts tightened in the workshop manual recommended ‘star’ tightening pattern. Timing side pinion bolted directly to the crank, tappets slid up to their home and the timing cams and gear meshed according to marks. I’m on a roll! 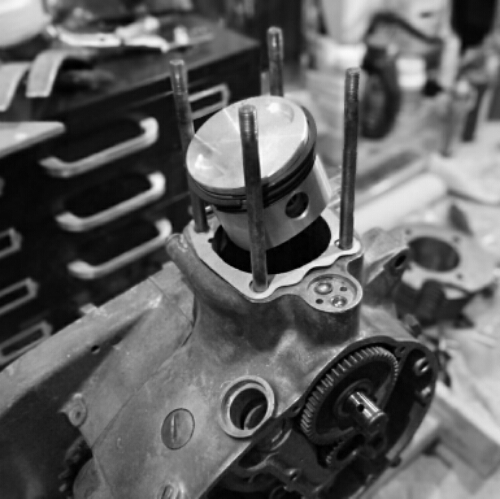 Cylinder studs threaded down into the lower, piston aligned with gudgeon pin and circlip retainers popped in. 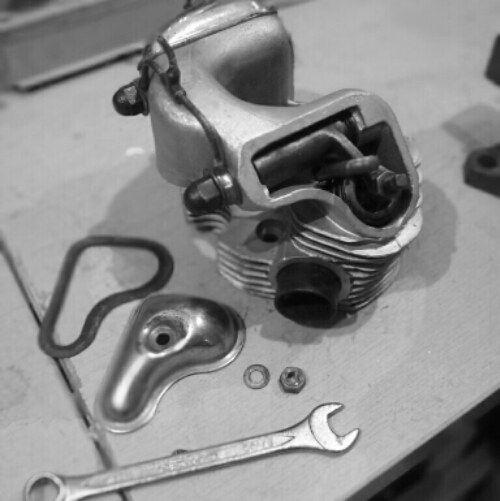 Barrel dropped into place minding that the piston rings seat between the piston and barrel wall itself. That’s enough for today! It all sounds like it went easily together but I don’t explain some removal, adjusting clearances, reassembling – repeat.. For a few of the steps. T’is the weekend and it’s time to hare down the A23 to the seaside. The pebbly beach fronted promenade is the place to be seen and Madeira Drive the strip to drag up and down. How low are those ‘bars? 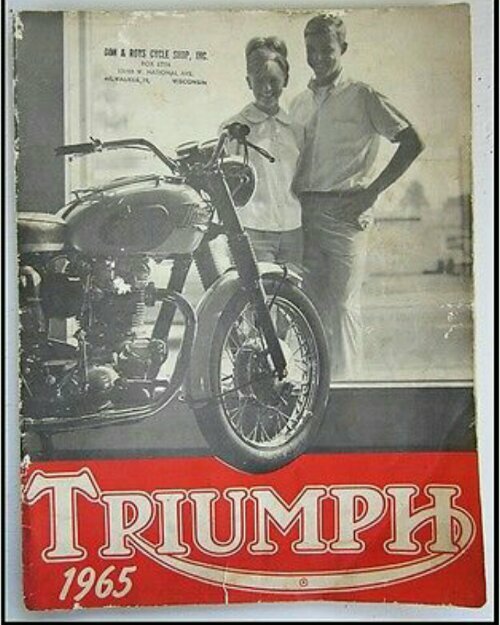 *Normal service to this blog will resume momentarily; in the meantime enjoy this Triumph Thruxton ‘strip art’. I’ve got a bleedin’ cold with a runny nose, stuffy heid and volcanic sneezin’! The twenty third of April is the feast of the Roman soldier George who was martyred on this day in the fourth century. 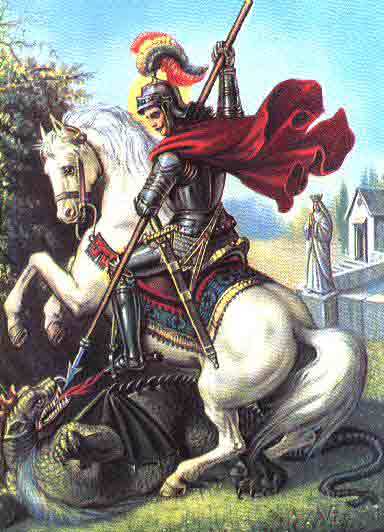 Typically shown defeating a dragon atop a white steed with maiden beyond his veneration is celebrated in many countries for his virtue. The English flag is his banner: a red vertical cross on white. Itself forming the very foundation for the Union Flag (Jack). Here is a Triumph Bonneville used as a modern ride leaning into one of the many corners of a latter day dragon: the Dragons Tail at Deals Gap in North Carolina, an 11 mile stretch of Route 129 with over 300 corners. Classic line in a classic British film from 1969. Caine is marvelous as Charlie Croker the gold bullion theft ring-leader. The car chase is in the top 3 of chases (Bullitt, The Blues Brothers?). The alpine and Turin scenery sublime. It was on the telly last evening in unedited wide screen format. Fabulous! 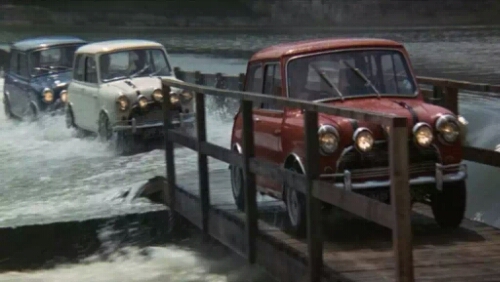 It just so happens the scene where they blew more than the bloody doors off was filmed in Crystal Palace Park in south London. 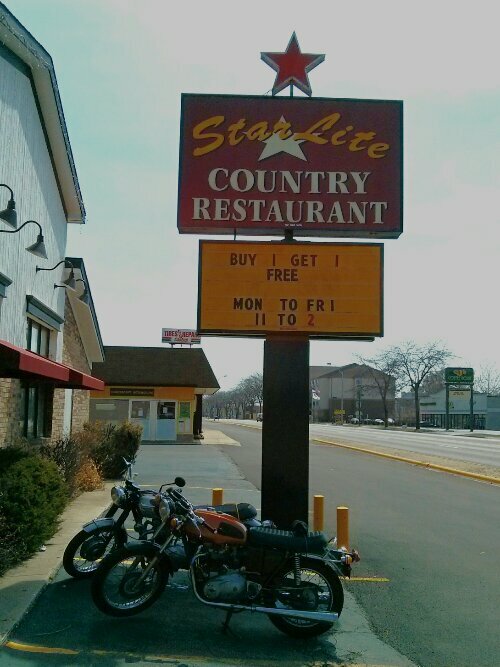 I first learned to ride a motorcycle in that park back in 1996. A Suzuki 125. Yesterdays jaunt was certainly a good ‘feather-winded’ trip to loosen overwintering riding skills as well as the bikes awakening leg-stretching. One electrical fault from a hibernating gremlin who had decided to sabotage the negative wire at the fuse. A quick roadside repair and an engine fires up again. But believe me, you slobs, it’s true. They’ll insert toasting forks in your tyres. But fact, none the less, to the few. 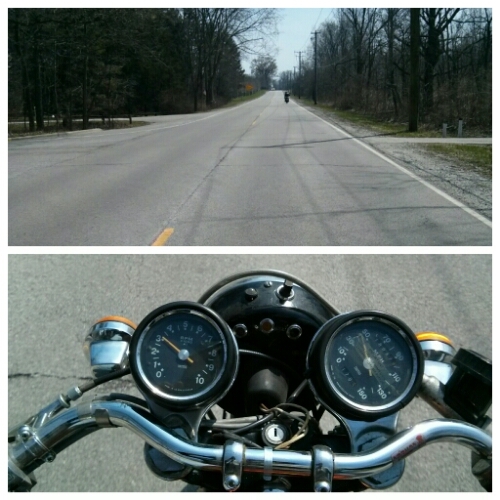 Perfect spring weather allowed a good spin on the bikes, up through Lake County and back along the North Shore. 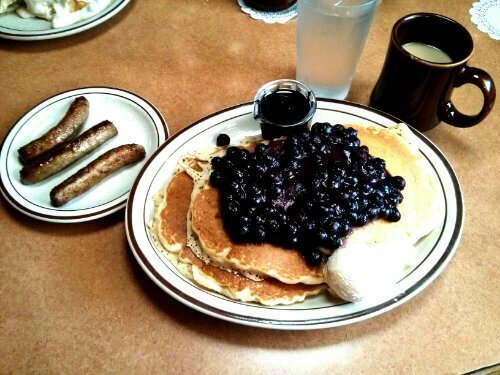 Lunch stop in Zion for some delicious blueberry pancake’s with sausage links on the side. Washed down with endless fresh coffee. Sunny? Oh yes! 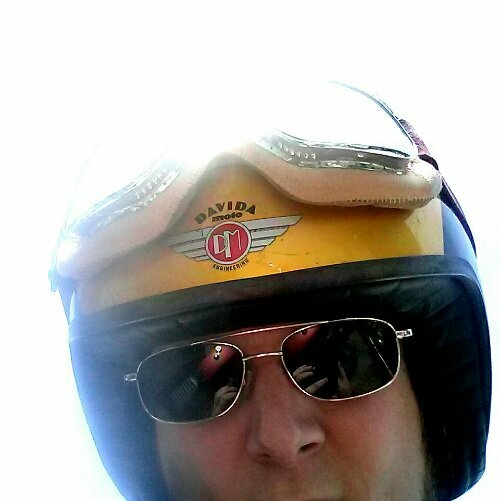 It was a sunglasses sky aloft…warm air blew through my unzippered jacket vents. A couple gaze adoringly at a possible new two-up ride. 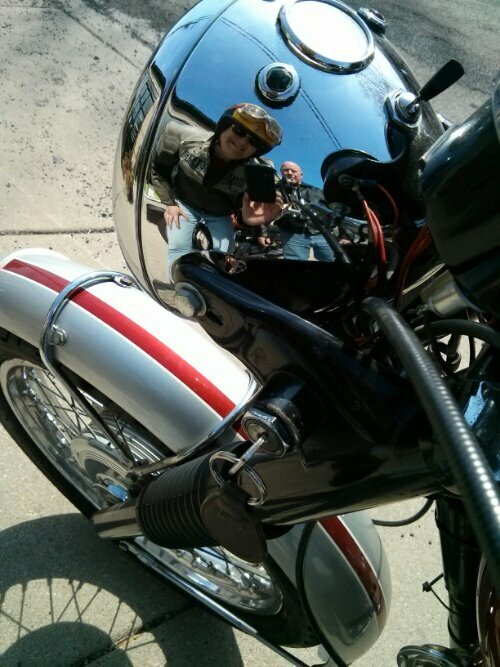 The shiny moto peers back at them coolly knowing they’ll undoubtedly make the purchase. This magazine cover has the typical B&W with color printing of the time for uncomplicated presentation. Nearly newspaper like. Bert Piddock is the man! 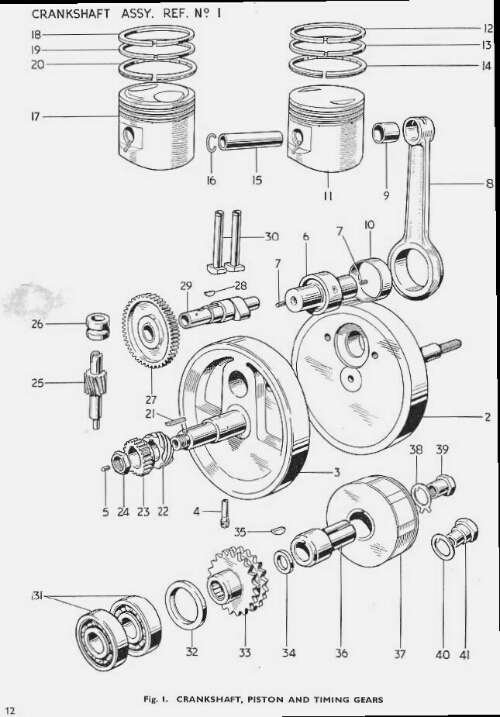 I need me this instruction manual for the reassembly…. A step-by-step photographic explanation of the strip-down and bolt-together of this diminutive power plant. Here’s the Bonnie fresh from its engine refit back in ’10. 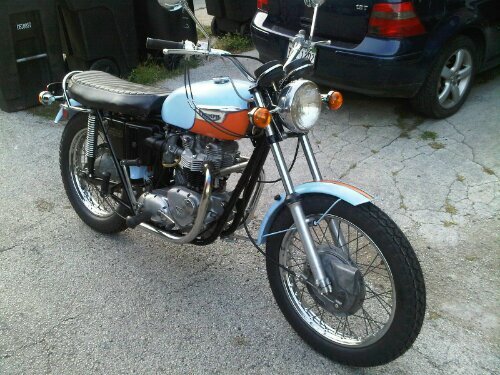 All splendid in its original Gulf color’s, drum front brake, upright bars and just a couple of dozen new miles on the Smiths clocks. 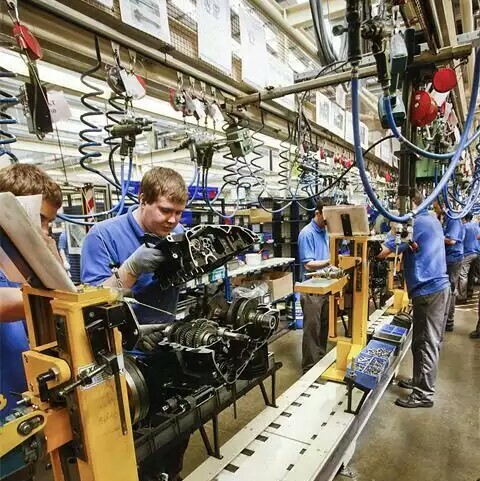 The factory line at Triumphs Hinckley plant is a stark contrast to my meager basement Cub rebuild. 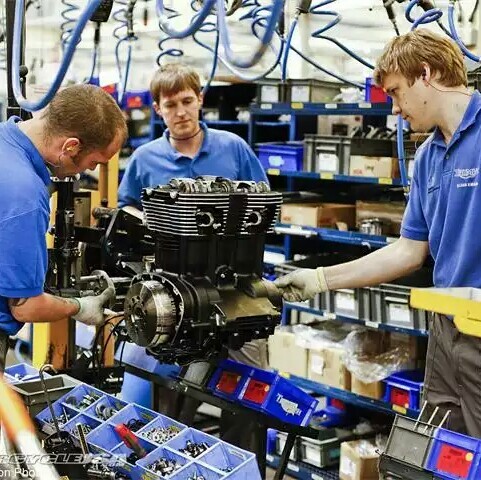 The stocked production process can spit out an engine every 85 seconds and, when under full throttle, a motorcycle every 2 minutes 25 seconds…. I need me a blue polo-shirt and khaki trousers..
‘Ave you got a torque wrench Bob?